It takes 18 months to get the fermented sauce that graces the steaks of so many. Worcestershire sauce follows in the tradition of fermented fish sauce found in many cultures, such as garum in ancient Rome. 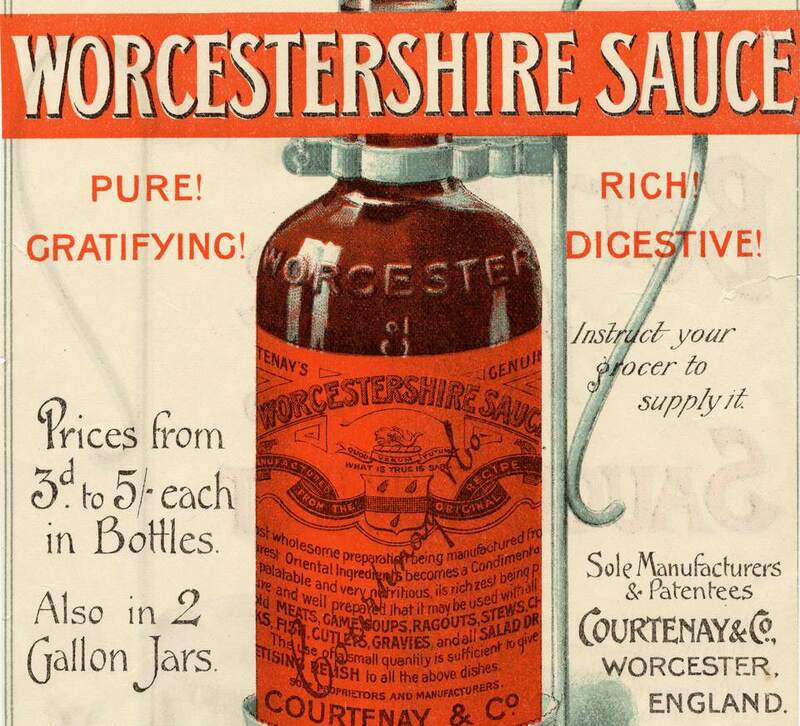 Worcestershire sauce has a history to go with its usefulness in flavoring drinks and food such as bloody marys, Caesar salads, steaks, oysters, and deviled eggs. Worcestershire sauce has its roots in India but was actually created by accident in its namesake town of Worcester, England in 1835. The Lea & Perrins company says Lord Sandys (whose identity is disputed) had returned home to England to retire after successfully governing Bengal, India for many years. He so missed his favorite Indian sauce that he commissioned drug store owners John Lea and William Perrins to come up with a reasonable facsimile. The original intent of the chemists was to keep some of the batch to sell in the store, but the fish and vegetable mixture had such a strong odor that they decided otherwise and stored it in the cellar. It lay forgotten for two years until it was rediscovered during a clean-up mission. The batch had aged into a wonderfully flavored sauce which was bottled and quickly became a hot item with customers. Lea and Perrins successfully branched out by convincing stewards on British passenger ships to include it on their dining table set-ups. It soon became a British staple, primarily as a steak sauce, and further emigrated worldwide. The bottles are still wrapped in paper as was done originally to protect them from breaking during sea voyages. Worcestershire sauce is known as the commercially bottle condiment to be imported to America, arriving in New York in 1839. The guarded recipe basically remains the same. However, the advertising no longer purports to "make your hair grow beautiful." The company lost the rights trademark the term Worcestershire sauce in 1876, so it can be used as a generic term for similar sauces. The full recipe for Worcestershire sauce has yet to be revealed by the original purveyors of this upscale condiment, Lea & Perrins. The original bottle shows the ingredients to be barley malt vinegar, spirit vinegar, molasses, sugar, salt, anchovies, tamarind extract, onions, garlic, and unspecified spices and flavorings. Some of the additional ingredients that may include lemons, soy sauce, pickles, and peppers. The U.S. version of Lea & Perrins Worcestershire sauce differs from the British recipe. In place of malt vinegar, distilled white vinegar is used and there's literally three times more sugar and slightly more than three times as much sodium per one-third ounce. The U.S. version is also labeled with a smaller serving size, a teaspoon is one serving in contrast to the British/Canadian one tablespoon. There's no explanation for the change, but many imported goods are specialized for the U.S.
You can make your own homemade Worcestershire sauce if you want more control over the ingredients and any additives.